Things still haven't quite got back to normal for us here, this blooming flu bug is still lingering but we're trying our best to carry on regardless. This Easter weekend we had a jam packed one planned but sadly something had to give and so we ended up cancelling everything but our Easter lunch yesterday, the good thing is that we are both feeling better because of it. This lack of energy has had one up-side and it has meant I've been able to spend some time keeping on top of the blogs I follow and do a spot of planning. One blog I always follow these days is 3princessesand1dude.blogspot.co.uk, Becky is incredibly witty and has a wonderful way of portraying parenthood in a hilarious manner, if you've not yet visited I'd highly recommend heading over there for a giggle! One thing Becky has started to do, is to collate lots of freebies and offers she finds over the web, I've signed up to many of these offers and others I've found on the web. Most of the time I forget that I've signed-up for freebies and I'm sure half of them never turn up! Last week, after signing up for the lastest offers posted at 3princessesand1dude I decided I'd create a little form to record the offers and freebies I signed up for so that I can track when (if) I receive them. 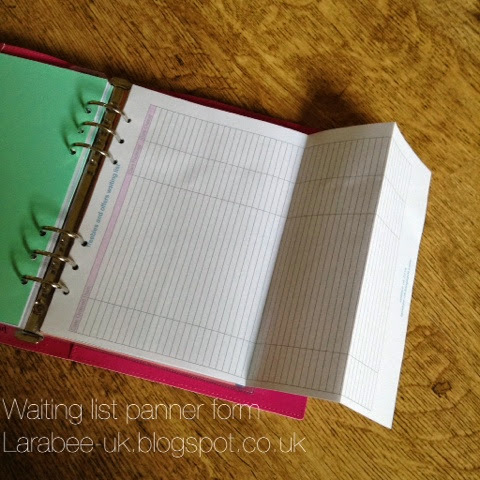 I've uploaded a copy of my freebies and offers waiting list to my google.docs account in case you find it useful, it is A4 sized but I use it in my A5 planner (as shown in the picture!) click here if you'd like a copy.